Strain tea and pour into a soda Siphon. Charge the Siphon with CO2 gas and keep cold. Make a strong infusion by steeping teabag in water for 5 minutes. Add sugar and stir to dissolve. Allow to cool. Add syrup to juice and mix. Pour into cryonitro bowl and pour in a good amount of liquid nitrogen to start as you begin to cool the cucumber liquid while gently whisking at first, then more and more vigorously as it starts to thicken. 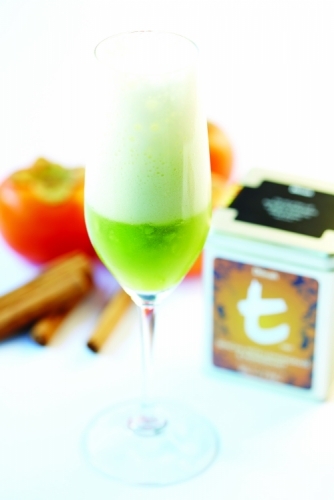 Place a scoop of sorbet into a champagne glass and top up with Sencha soda.